Step out of Las Vegas with an excursion to Hoover Dam in Boulder City--about 50 minutes away. The adventure continues: ponder the design of Bellagio Fountains, try to win big at New York New York Casino, examine the collection at The Mob Museum, and get a taste of the local shopping with The Strip. To find photos, reviews, ratings, and more tourist information, you can read our Las Vegas day trip planning tool . Sydney, Australia to Las Vegas is an approximately 20-hour flight. You can also do a combination of flight and bus. The time zone difference when traveling from Sydney to Las Vegas is minus 18 hours. In November, Las Vegas is a bit cooler than Sydney - with highs of 23°C and lows of 9°C. Wrap up your sightseeing on the 6th (Wed) to allow time to travel to Dallas. Kick off your visit on the 7th (Thu): take in nature's colorful creations at Dallas Arboretum & Botanical Gardens, tour the pleasant surroundings at Vitruvian Park, and then don't miss a visit to Pioneer Plaza. Here are some ideas for day two: explore and take pictures at AT&T Stadium, then admire the masterpieces at Kimbell Art Museum, then explore and take pictures at Botanical Research Institute of Texas, and finally contemplate the long history of Top O'Hill Terrace. To find traveler tips, reviews, and other tourist information, refer to the Dallas road trip tool . Traveling by combination of flight and tram from Las Vegas to Dallas takes 6 hours. Alternatively, you can drive; or take a bus. The time zone difference when traveling from Las Vegas to Dallas is 2 hours. In November, plan for daily highs up to 22°C, and evening lows to 11°C. Wrap up your sightseeing on the 8th (Fri) early enough to travel to New Orleans. New Orleans is known for historic sites, museums, nightlife, shopping, and parks. Your plan includes some of its best attractions: brush up on your military savvy at The National WWII Museum, take in the architecture and atmosphere at St. Louis Cathedral, stroll through New Orleans City Park, and meet the residents at Audubon Zoo. To see more things to do, ratings, and other tourist information, you can read our New Orleans attractions planner . Traveling by flight from Dallas to New Orleans takes 4 hours. Alternatively, you can drive; or take a bus. Traveling from Dallas in November, expect nights in New Orleans to be a bit warmer, around 19°C, while days are little chillier, around 19°C. Finish your sightseeing early on the 13th (Wed) to allow enough time to travel to Miami. Explore Miami's surroundings by going to Everglades National Park (Gumbo Limbo Trail, Slough Slog, & more). There's lots more to do: enjoy the sand and surf at South Beach, appreciate the extensive heritage of Art Deco Historic District, enjoy some diversion at Lock & Load Miami, and wander the streets of Lincoln Road. For where to stay and other tourist information, read Miami trip builder . Traveling by combination of flight and tram from New Orleans to Miami takes 4 hours. Alternatively, you can do a combination of flight and bus; or drive. Due to the time zone difference, you'll lose 1 hour traveling from New Orleans to Miami. Traveling from New Orleans in November, expect Miami to be somewhat warmer, temps between 32°C and 24°C. Finish up your sightseeing early on the 18th (Mon) so you can go by car to Cape Canaveral. Cape Canaveral is a city in Brevard County, Florida. Get out of town with these interesting Cape Canaveral side-trips: Green Springs Park (in Enterprise), DeBary Hall Historic Site (in DeBary) and Canaveral National Seashore (in Titusville). Next up on the itinerary: look and learn at NASA Kennedy Space Center Visitor Complex, look for all kinds of wild species at Enchanted Forest Sanctuary, and visit a coastal fixture at Cape Canaveral Lighthouse. To see other places to visit, photos, reviews, and more tourist information, use the Cape Canaveral route planning tool . Traveling by car from Miami to Cape Canaveral takes 4 hours. Alternatively, you can take a bus. Traveling from Miami in November, expect a bit cooler with lows of 20°C in Cape Canaveral. Finish your sightseeing early on the 21st (Thu) to allow enough time to travel to Boston. 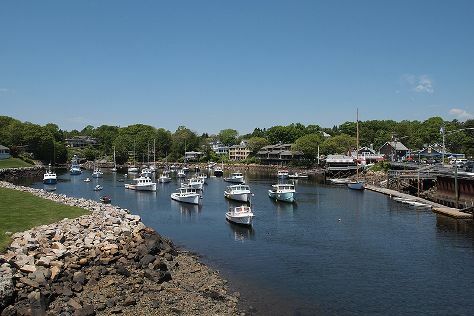 Explore Boston's surroundings by going to Marginal Way Walkway (in Ogunquit), Sandwich (Sandwich Glass Museum & Heritage Museums & Gardens) and Brewster Gardens (in Plymouth). There's lots more to do: explore the world behind art at Museum of Fine Arts, admire all the interesting features of USS Constitution, kick back and relax at Race Point Beach, and stroll the grounds of Mount Auburn Cemetery. To find maps, ratings, other places to visit, and more tourist information, refer to the Boston travel planning website . You can do a combination of bus and flight from Cape Canaveral to Boston in 8 hours. Alternatively, you can drive; or do a combination of bus and train. Expect cooler temperatures when traveling from Cape Canaveral in November; daily highs in Boston reach 13°C and lows reach 3°C. Cap off your sightseeing on the 27th (Wed) early enough to travel to New York City. New York City is known for museums, nightlife, shopping, historic sites, and parks. Your plan includes some of its best attractions: explore and take pictures at Central Park, pause for some photo ops at 9/11 Memorial, admire the striking features of Rockefeller Center, and don't miss a visit to Statue of Liberty National Monument. Traveling by combination of bus and flight from Boston to New York City takes 3.5 hours. Alternatively, you can do a combination of bus and flight; or drive. Traveling from Boston in November, expect a bit warmer with lows of 7°C in New York City. Cap off your sightseeing on the 4th (Wed) early enough to travel to Los Angeles. Venture out of the city with trips to Anaheim (Disneyland Park & Disney California Adventure Park). Pack the 7th (Sat) with family-friendly diversions at Universal Studios Hollywood. Next up on the itinerary: examine the collection at The Getty Center, partake in some friendly competition at Fantastic Race, see a show at Walt Disney Concert Hall, and get outside with Self Realization Fellowship Lake Shrine Temple. To see other places to visit, more things to do, ratings, and tourist information, you can read our Los Angeles trip itinerary site . You can fly from New York City to Los Angeles in 9 hours. Other options are to do a combination of bus and flight; or drive. The time zone difference when traveling from New York City to Los Angeles is minus 3 hours. When traveling from New York City in December, plan for much hotter days and somewhat warmer nights in Los Angeles: temperatures range from 24°C by day to 11°C at night. On the 12th (Thu), you'll travel back home.